Sabrina and Corey have been together for more than six years. They share a life and two beautiful children, but there was one more story they wanted to create together: the tale of becoming husband and wife. As they planned their wedding, they realized that the most important thing to them was not a guest count in the hundreds or a lavish venue: it was the lifelong commitment they were about to make to each other and their sons in their backyard in Gloucester with memories captured by Maria Grace Photography. 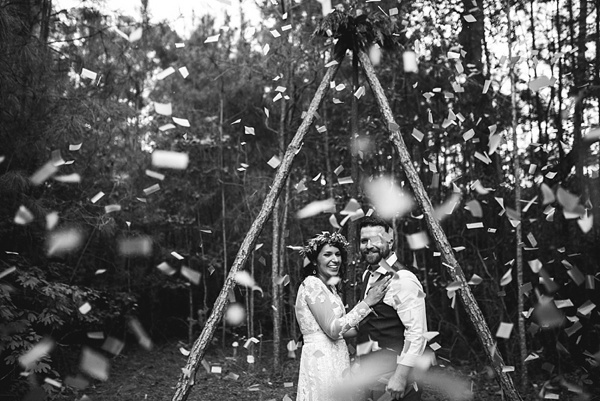 In rustic bohemian style with handmade treasures, these two lovebirds envisioned an intimate micro-wedding that was everything special about a wedding day. They wanted to have both of their personalities infused into all aspects of the celebration. Between Corey's woodsy spirit and Sabrina's love of colorful boho style, it was the perfect match filled with rustic cake donuts (including a cinnamon sugar-inspired donut cake! ), wildly arranged flowers in geometric vessels, and a hand-crafted ceremony arch made from wood on their property. Basically, get ready for a wedding full of sweetness and smiles! Thanks to vendor fam Maria Grace Photography, we were honored to also share their love story in the Tidewater and Tulle Journal Spring 2018 issue. Take a peek at their special day in print, too!